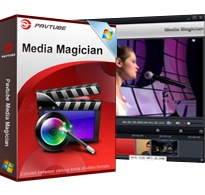 Pavtube Media Magician – Manage/backup/lossless join/convert/edit camcorder AVCHD MTS/M2TS/MXF and upload to YouTube. 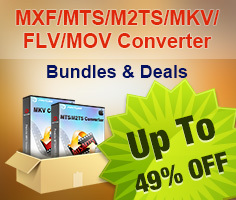 Pavtube Media Magician is a nice camcorder assistant manager, lossless camcorder video joiner, MTS/ M2TS/ MXF/ MOV/ MKV/ TiVo/ WMV/ AVI/ MPG converter and editor, and efficient camcorder video uploader for YouTube. The smart camcorder wizard helps organize, backup and import camcorder videos with ease. And timeline-oriented editing tools help accurately trim and cut clips frame by frame. Format presets provide you the easiest way to output the right format with the best recommended settings. The output task manager also helps create multiple tasks in different formats for Andoid/iOS/Windows tablets and phones like Galaxy Tab/ Amazon Kindle Fire HD/ iPad/ AppleTV/ Microsoft Windows Surface RT, editing software such as Adobe Premiere/ Sony Vegas/ Cyberlink PowerDirector, or upload to YouTube at the same time. It's a useful and easy tool helping you make better use of either camcorder videos, but also common videos. Using the Smart Camcorder Wizard, you can automatically detect the camcorder, sort, preview, backup and import videos with ease. If import MTS/M2TS/MOD/TOD video with same codec, you can output lossless videos with original format or MKV. And on the timeline, you can accurately cut and trim unwanted commercials at any point and join them into one. You needn't render the camcorder video clips while editing on timeline. And it's easy and accurate to trim or cut frame by frame, delete, rearrange, and join the clips. You can create multiple conversion tasks from the same source files placed on timeline. The tasks can be added, paused, and deleted any time you like. In Online Section, you can set YouTube account and video info and upload to YouTube automatically from the sources placed on timeline. Save Media Library for fast import videos in further editing. By highlighting a clip on timeline, and go to the 3D effect tab, you can enable and choose 3D effects for the output video. In Effect tab, you can adjust brightness, contract, saturation, as well as add special effects like Aged Film, Simple Gauss Blur, etc. and help you get the best effect for the video. The preset formats are sorted in device, editing software, online, and common categories with the best recommended settings. You can choose and output easily with clicks. It outputs video formats like *.mpg (MPEG-2), *.mp4 (MPEG-4), *.avi, *.wmv, *.mov, *.mkv, *.m2ts and *.webm (for YouTube only). Editor: Avid Studio (*.mov), Adobe Premiere & Sony Vegas (*.wmv, *.mov, *.mpg), Adobe After Effect (*.mpg, *.mov), Cybelink PowerDirector (*.avi, *.wmv), Pinnacle Studio (*.mp4, *.mpg). A: All of our programs are platform-independent ones but not cross-platform. So Windows software cannot be installed onto a Mac computer and vice versa. A: A trail version converts videos with watermark (the logo of Pavtube) on the screen and asks if you would like to purchase at each run while a retail version allows you to use freely without putting on watermark. What’s more, trial version has 5 minutes limit for lossless output. As a customer of Pavtube, you will be reminded to update the software whenever a new version is released. The update is free of charge for lifetime. Besides, your emails will be attended at the first time, your advice and requirements will be much valued when we upgrade the software. A: Drag the clips you want to merge to timeline, edit the clip by trimming, cutting, rearranging order, and delete unwanted clips. And then go to Conversion tab to create output task. All files on timeline will be output as one file in the format you choose in the output task. A: Please right-click on the created output task and choose Rename on the menu. And then you can set the output file name. How to merge .mov files and convert into .mp4? How to do simple special effects and brighten or darken video clips easily?